September Newsletter: Tribal Gatherings, Foiling And Technical Updates from F101. Format: Racing Saturday and Sunday – sailing before and after for those that can! The F101 Tribe are formally invited to attend the next Foiling World Tribal gathering. We will introduce the new Tribe friendly format where you can either sail every race or compete and score results based on every second race - ideal for sharing with a friend. We will also allow you to play a “Joker”, (only one per day) where someone else can sail your boat and count the result for you. If they win, they are a winner takes all result, more details will follow! This will be a great Tribal Gathering where we'll be running a training course for our Dealers in the run-up to the event. We hope to have representatives from the United Kingdom, Spain, France, Italy, United States, Canada and possibly even Australia! We all need help to get the most out of our sailing so we are pleased to now have coaching available in the UK. Simon Hiscocks, top Moth sailor and Olympic Medalist now has an F101 in Weymouth at the National Sailing Academy (a great venue and home of the 2012 Olympics). 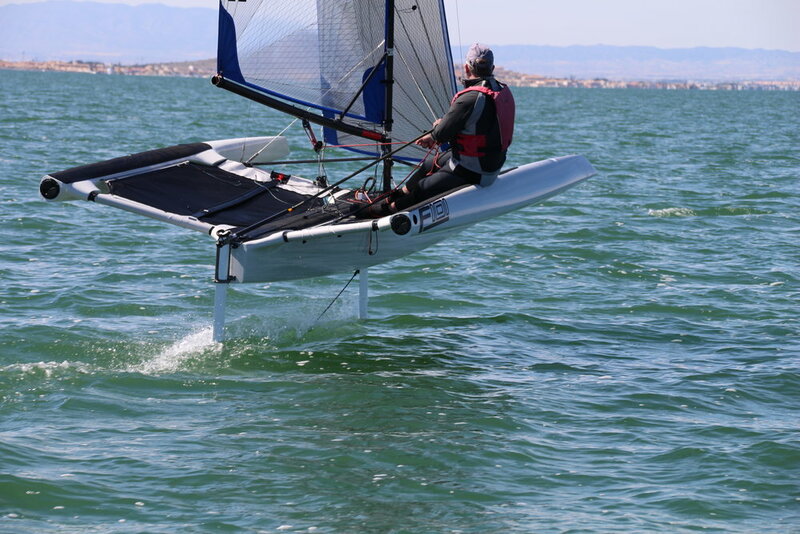 For information on coaching courses with Simon please contact info@Foiling101.com. We also hope to have Simon at the Tribal Gathering in November; check out his gybing skills below and we're sure you'll agree he would be a great person to play the Joker for you! If you or any of your friends are interested in joining the Tribe and purchasing an F101 Alan and Rob will be running a Try Flying course at Draycote Water on October 6th, please contact us at info@Foiling101.com for details. Try Foiling - Contact Us! Last week, when sailing with Simon in Weymouth, we came across some squad Laser sailors out in their Waszp Moths (5 of them). It was interesting to note that even with the windage of the Zero, we were at a very similar speed upwind, sometimes higher and faster. Downwind it was over 11 knots and our Zero was not being used and we are happy to report back that we were lower, and faster and if they made a mistake, they crashed and capsized while the F101 simply touched down and went off again, making it a pretty easy winner down wind. We are thinking of doing Bart's Bash in September as well as Weymouth Speed Week! We will report back in a future newsletter with our findings. Boats are now active with dealers in Spain, France, italy and China. Pietro has been putting the hours in on Lake Garda, so we are looking forward to his arrival at a Tribal gathering. Spain will be a great opportunity to share stories and technique improvements, all part of the Tribe ethos of sharing experiences and learning from each other. These will also be shared in subsequent newsletters. Foil In An F101 With Negrinautica. The carbon Zero brackets should now be with you and if anyone is missing one simply let us know. We will also be sending out the last of our upgrades which is the Harken produced replacement stainless steel version of the Gnav slider that sits on the boom. We had a number of the original alloy versions break in very strong winds and this will solve that issue, this will be a slight weight gain but worth it in terms of reliability. We are sad to say that Jerry Hill, founder member of FOILING WORLD, will be taking a less active role as we move forwards. Always part of the team, Jerry will still be at events sailing, socialising but not mending or rigging boats, as he will be there as a sailing member of the TRIBE. We would just like to take this opportunity to thank Jerry for his vision and dedication in getting the F101 to where it is today and now we look forward to sailing against him.